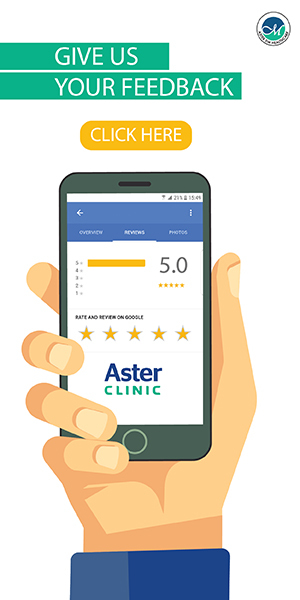 The flagship Clinic of the group with an excellent track record and several specialties Aster Clinic (Al Rafa Poly Clinic and Indian Specialist Medical Centre) has earned the reputation of providing comprehensive healthcare services at affordable costs. 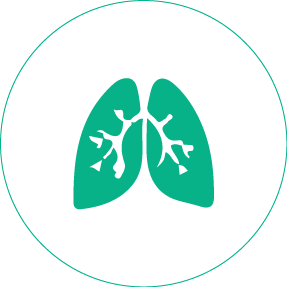 With a dedicated team of internationally trained and experienced specialists aided by modern diagnostic equipment, the clinic helps ensure prompt diagnosis and dependable treatment. 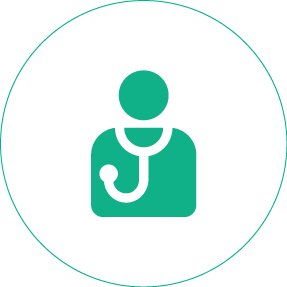 We represent a complete family clinic with all specialty services under a single roof. Starting 2013, coinciding with the silver jubilee of the parent company Aster DM Healthcare, the two clinics have been merged into one as came to be known as the Aster Jubilee Medical Complex. 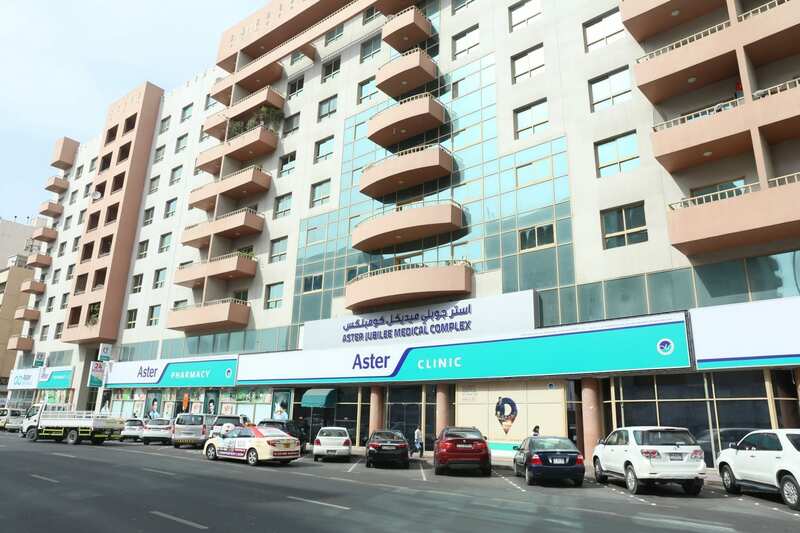 Aster Clinic, Bur Dubai (AJMC, Bank St.) is open 24 Hours. 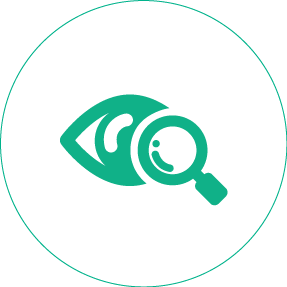 Ophthalmology is the branch of medicine that deals with the anatomy, physiology, and diseases of the eye. 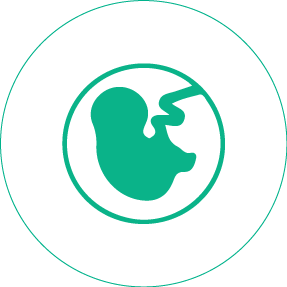 Endocrinology is the branch of physiology concerned with the endocrine glands and the hormones they release. 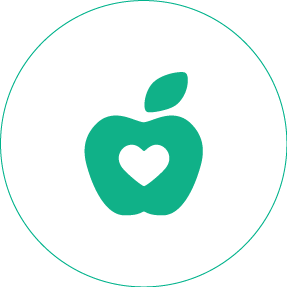 Dietetics is concerned with diet and its effects on health, especially with the practical application of a scientific understanding of nutrition. 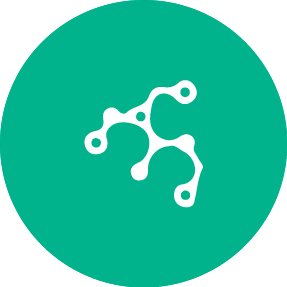 Rheumatology is a branch of internal medicine and paediatrics that is concerned with the diagnosis and treatment of rheumatic diseases. 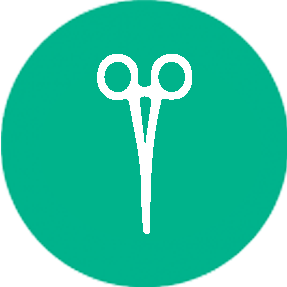 General surgery is a discipline that focuses on the pre/post operative management of patients with a broad spectrum of diseases. 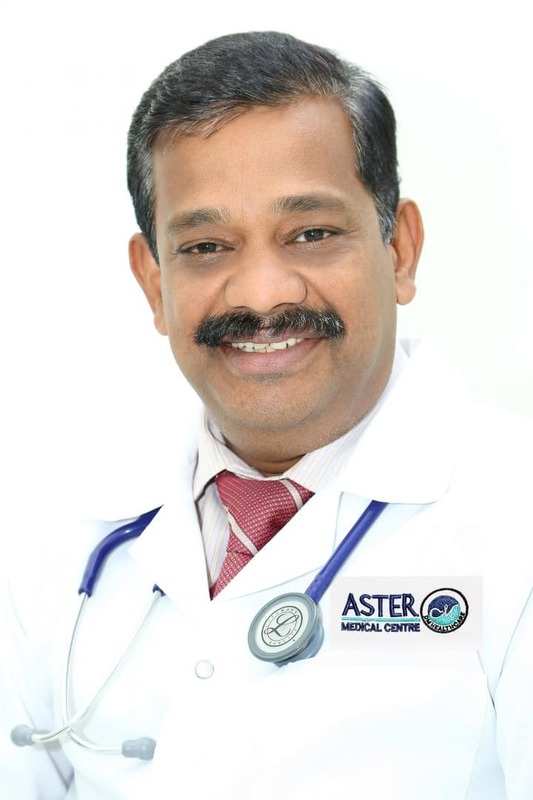 Dr. Binu Thomas is a Specialist Internal Medicine with Aster Clinic(Aster Jubilee Medical Complex), Burdubai. He has done his MBBS from Calicut University, Kerala (1982) and MD from Kasturba Medical College, Manipal University, Karnataka (1989). He is having 26 years of experience after post graduation. He has joined Aster DM Healthcare in the year August 1999. Dr. Bijumon Varkey has done his MBBS from Calicut University in the year 1995, and MD from Christian Medical College, Ludhiana (Baba Farid City of Health Science) in the year 2002. 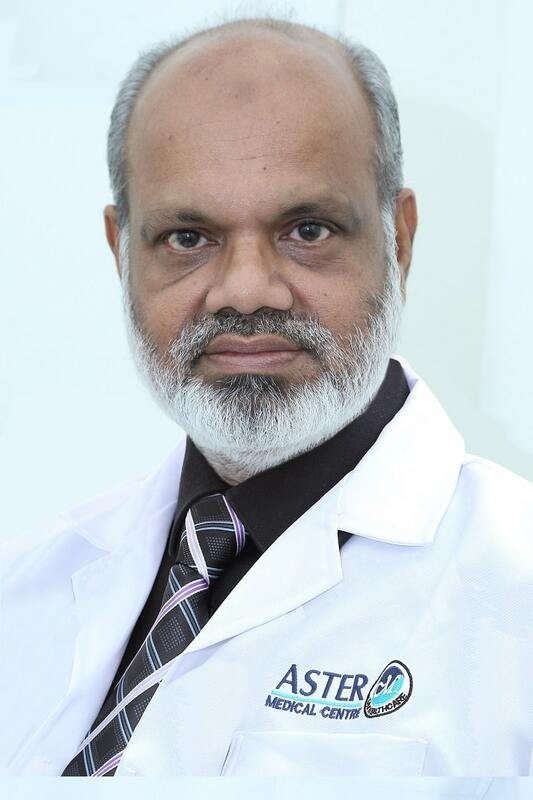 He was working as General Physician at KMC Hospital, Kerala, and General Physician in various clinics in Dubai. He completed his membership of the Royal College of Physicians, London (UK) (MRCP) in the year 2006. He has joined DM Healthcare in the year July 2005. 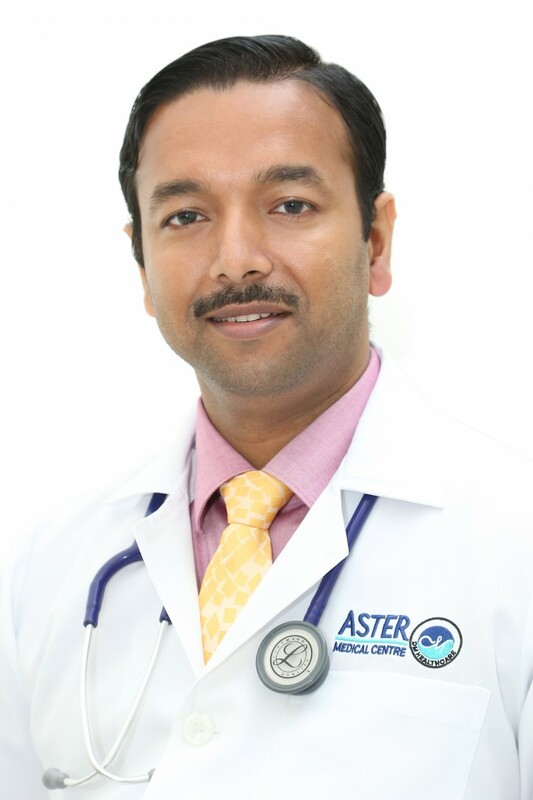 Dr.Bijumon is working as a Specialist Internal Medicine at Aster clinic, Bur Dubia (Aster Jubilee Medical Complex). 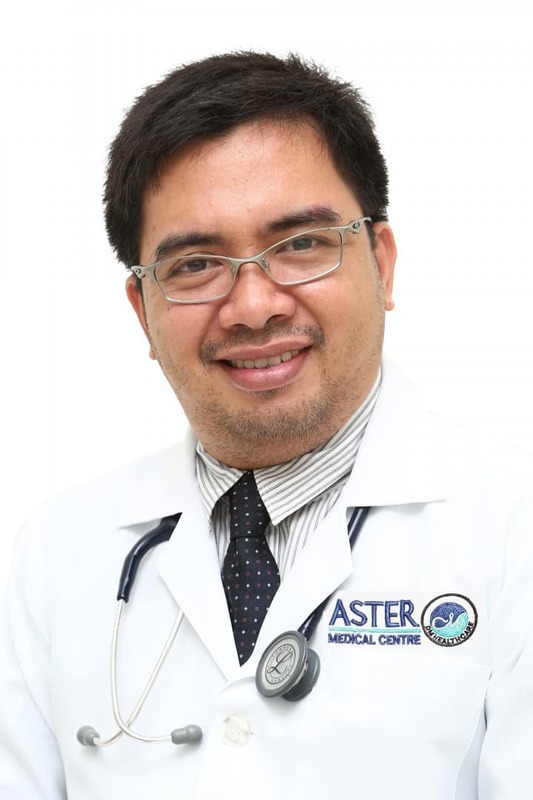 Dr. Dennis is working as a General Physician at Aster Clinic (Aster Jubilee Medical Complex), Burdubai. He has completed his MBBS in 2002 from De-la-salle health sciences institute from the Philippines. He has overall 11 years of experience. He was working in Riyadh, KSA for a period of 3 years. 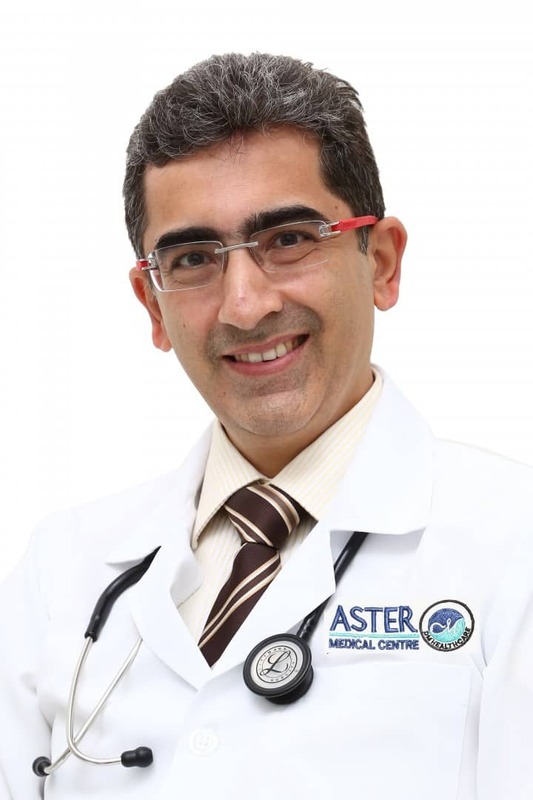 Dr. Nasrullah Jakhrani is working as a Specialist Internal Medicine at Aster Clinic (Aster Jubilee Medical Complex), Burdubai,Dubai. He has completed MBBS from Liaquat University of Medical & Health Sciences, Pakistan, FCPS (Internal Medicine) from College Of Physicians Surgeons, Pakistan and MRCP from the Royal College of Physicians, UK. He brings with him over 5 years of post PG experience in Pakistan and KSA. 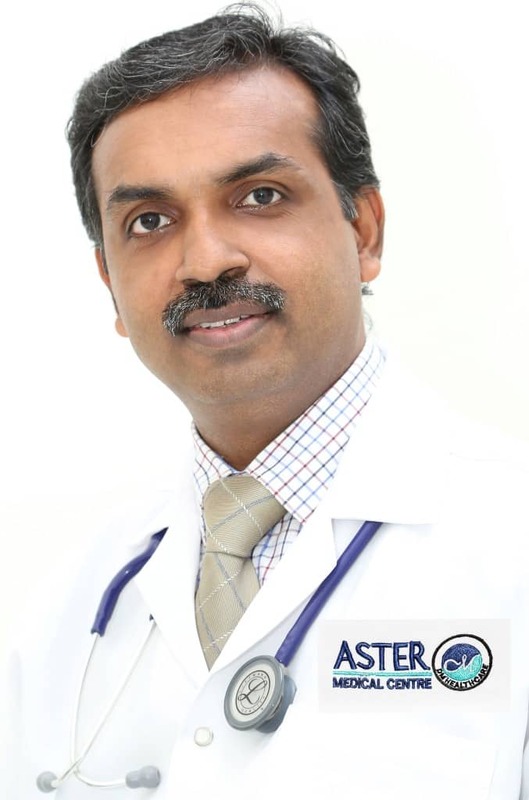 Dr. Prasanth is working as a Specialist Internal Medicine at Aster Clinic(Aster Jubilee Medical Complex), Burdubai. He has completed MBBS (1989) from Calicut University and MD (1995)Indira Gandhi Medical College, Nagpur, India. He has done Post Graduate Diploma in Diabetes Mellitus from South Wales university, UK. He has more than 22 years of experience in India and UAE. In India he was working as an Associate professor in the department of medicine at Academy of Medical Sciences, Pariyaram, Kerala. His last assignment was with Dubai Tower Medical Centre before joining with us. He joined DM Healthcare in May 2006. Dr. Vani completed her MBBS in the year 1983 from Calicut University and MD in the year 1990 from Dr. M G R Medical University, Tamil Nadu. She has also completed her Post Graduation Diploma in Diabetes Mellitus from Leicester University(UK) in 2013. 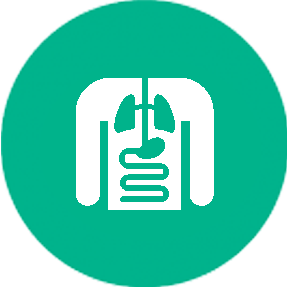 She has around 25 years of experience in various hospitals across India and UAE. For the past 16 years, she is working with DM Healthcare. 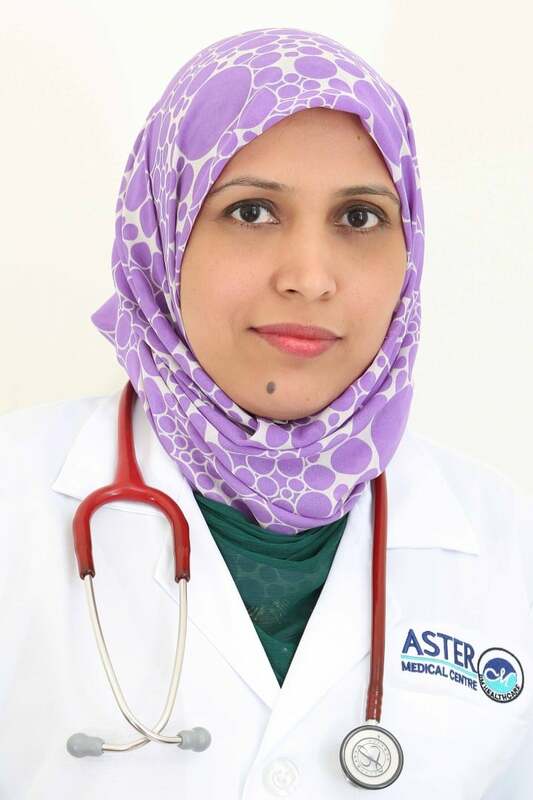 She joined Aster DM Healthcare in 2001 and is working as a Specialist Internal Medicine at Aster Clinic, Bur Dubai (Aster Jubilee Medical Complex). Dr. Harikanth has done his MBBS from Dow Medical College, Karachi Pakistan in the year 1994 and FCPS in the year 2003 from Fellow of College of Physician and Surgeon, Pakistan. He was working in various hospitals in Pakistan and then moved to KSA worked there for 2 years.He has joined DM Healthcare as Specialist Physician in August 2008. 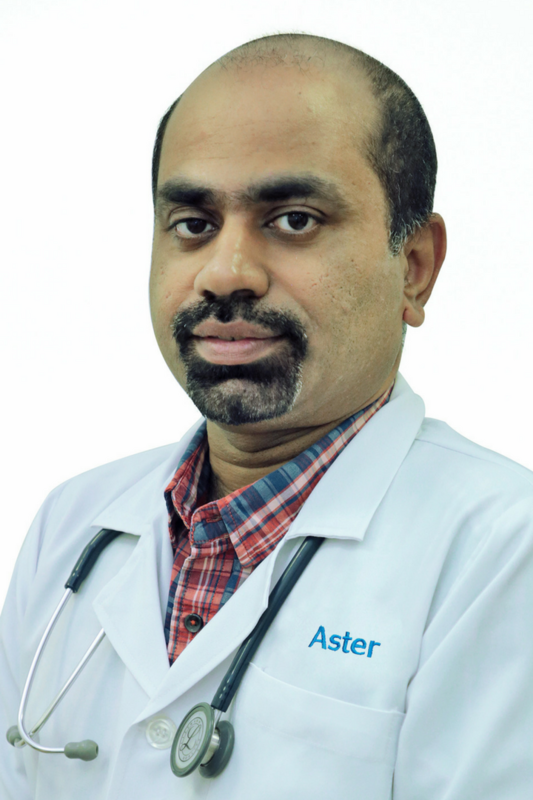 Dr. Spurthy Sirivella is working as a General Physician at Aster Clinic, Bur Dubai (AJMC). She completed her MBBS from MIMS in the year 2012. She has also worked for Apollo Hospitals in India, before joining Aster DM Healthcare in the year 2014. 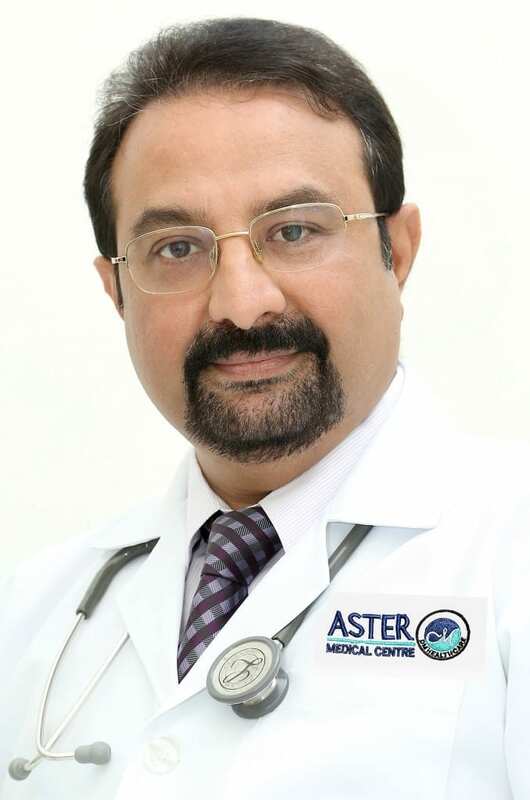 Dr. Sunil Trivedi is working as a General Practitioner at Aster Clinic, Bur Dubai (Aster Jubilee Medical Complex). He completed his MBBS from Topiwala National Medical college/BYL Nair Hospital, Mumbai, India in the year 2006. 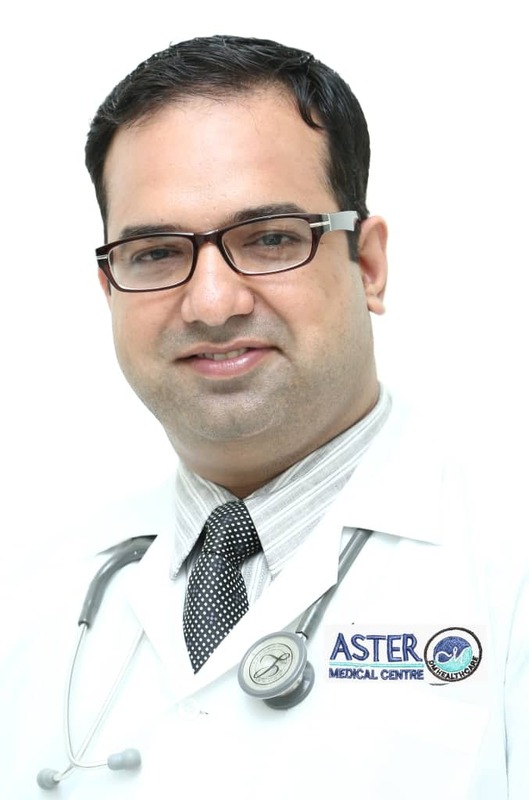 Before joining Aster DM Healthcare, he was working with S.L Raheja Hospital Mahim, Mumbai for almost 3 years. After that, he was also working for Karuna Hospital, Mumbai. He became part of Aster DM Healthcare in the year 2015. 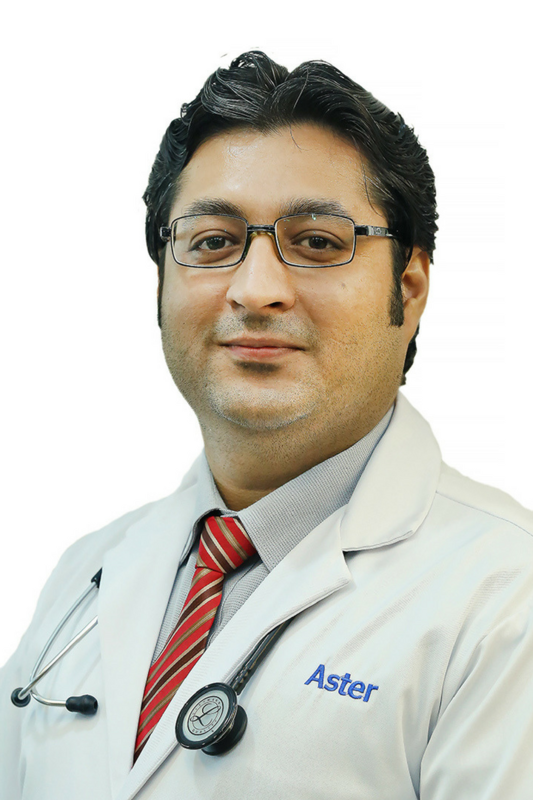 Dr. Husnain Basharat is a General Physician practicing at Aster Clinic, Bur Dubai (AJMC). Dr. Husnain completed his MBBS (2010) from the Xi'an Jiaotong University in China and has achieved certifications in both Disaster Management and Life Security as well as BLS. Following his education, he worked as a General Physician at the Aziz Bhatti Shaheed (DHQ) Teaching Hospital in Pakistan and as a Medical Practitioner with the Maldives Ministry of Health. 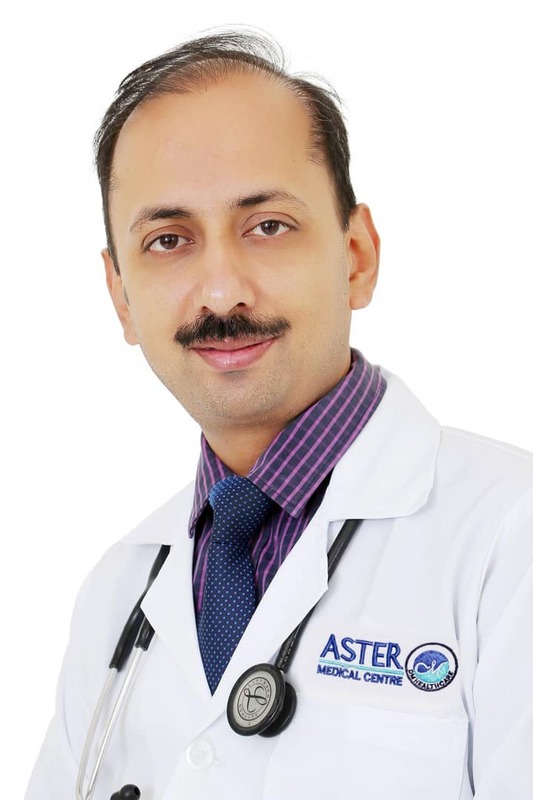 Dr. P. M. M. Sayed is working as a Specialist Pediatrician at Aster Clinic, (Aster Jubilee Medical Complex), Burdubai. Dr. P M Mohamed Hydrose Sayed has completed his MBBS in the year 1977 from University of Kashmir and DCH in the year 1985 from Mysore University, India. 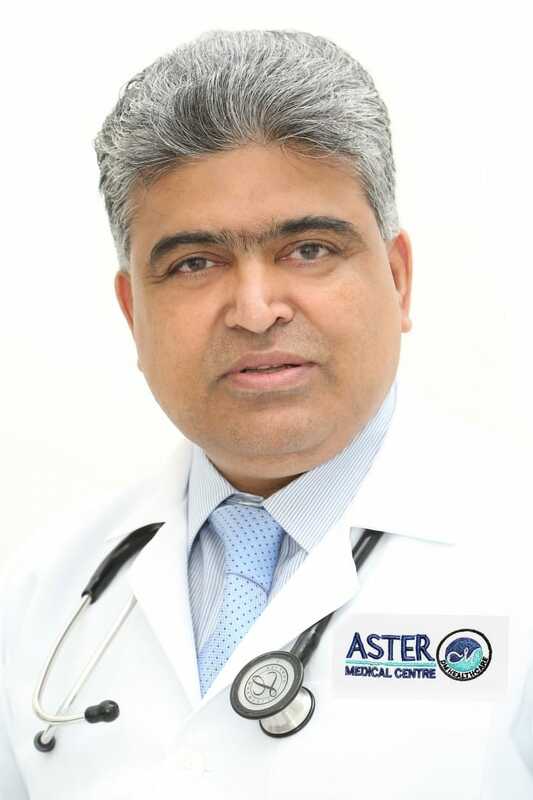 He joined Aster DM Healthcare in 1987 and was promoted to the Medical Director in the year 1988. He also has experience in the Ministry of Health in Oman. Dr. Meenu Agarwal has completed her MBBS (1983) & MD (1987) from Kanpur University, India. She was working in various hospitals and also had her own clinical practice. 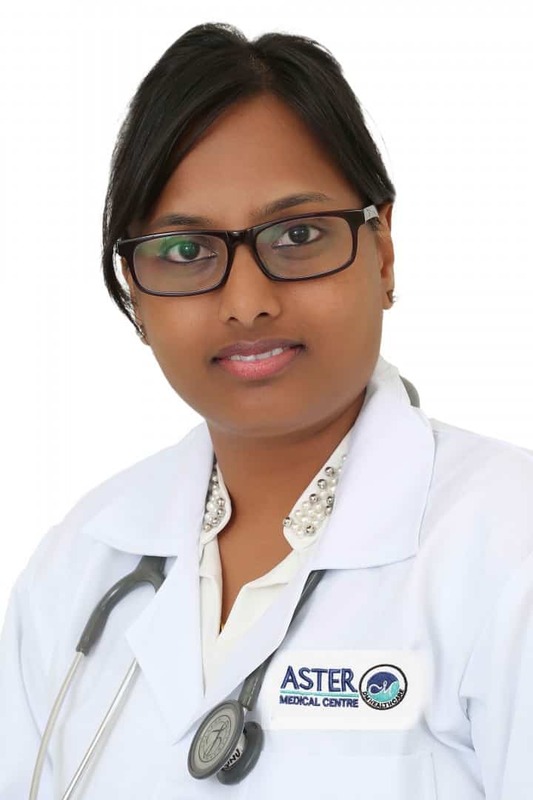 She joined Aster DM Healthcare in May 2004, she is working as a specialist paediatrician at Aster Clinic (Aster Jubilee Medical Complex), Burdubai. Dr. Khairunnisa Mattummal has completed her MBBS in the Govt. Medical College Calicut and her DCH & MD in Pediatrics in the Govt. Medical College Kottayam, Kerala, India. She did her Post-Graduate Diploma in Developmental Neurology (PGDDN) under the Centre for Child Development, Trivandrum Medical College. She has worked in the Govt. 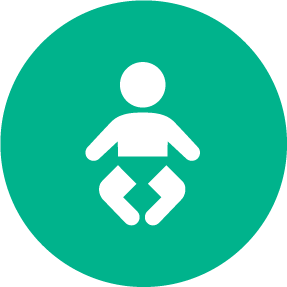 District Hospital Tirur as Pediatrician and Neonatologist. 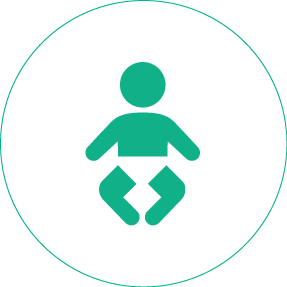 Working in Dubai since 2010 as a Specialist Pediatrician, her special interests include Pediatric asthma and allergic disease, Developmental delay, ADHD, Learning disabilities, Thyroid disorders in children and Re-establishment of failed breastfeeding in newborn babies. 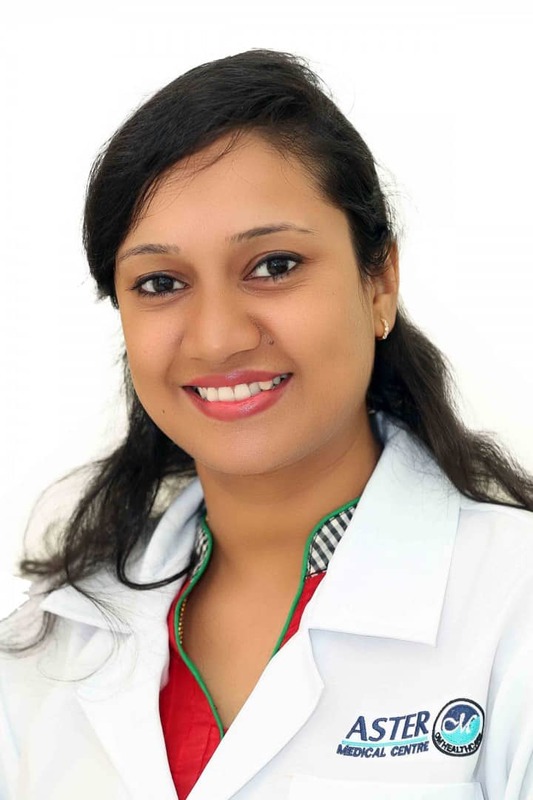 She joined Aster Jubilee Medical Complex, BurDubai as a Specialist Pediatrician in September 2014. Dr. Swati has completed her MBBS (1994) & MD (1999) from Pune University. She started her career as Asst. Professor in Pravara Medical College and then moved to private practice in different Hospitals as a Consultant. She has more than 15 years of experience. She joined Aster DM Healthcare in December 2010 as a Specialist Gynaecologist in Aster Jubilee Medical Complex, Bur Dubai. 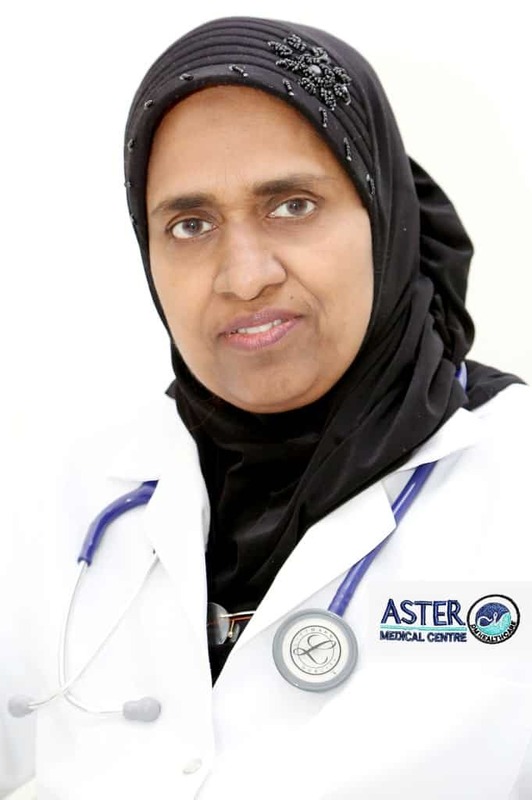 Dr. Haleema Mohammed has completed her MBBS (1979) from Calicut University, India, DGO (1990) and MD (1991) from prestigious Kasturba Medical College, Karnataka, India. 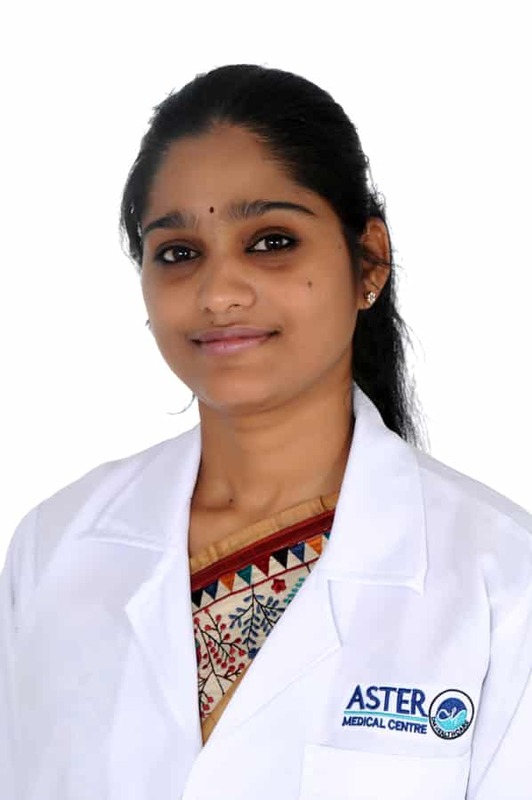 She was working in various hospitals and clinics in India & UAE before her MD and after her post graduation, she started her career in ESI hospital, Palakkad, India. 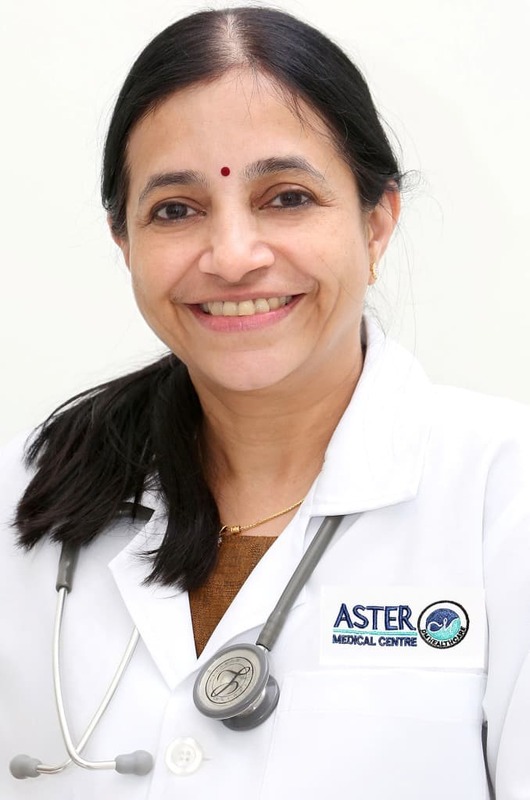 She joined Aster DM Healthcare as an Obstetrics & Gynecology Specialist in July 1993. Dr. Thannikot Mathai Jaison has done his MBBS (1974), MD (1979), and DM (1983) from the prestigious Christian Medical College in India. He started his career in the same institute as Registrar and was subsequently promoted to Professor and Head of the Department before joining Aster DM Healthcare. He joined Aster DM Healthcare in August 2006, now he is working as a cardiology specialist in Aster Jubilee Medical Complex, Bur Dubai. 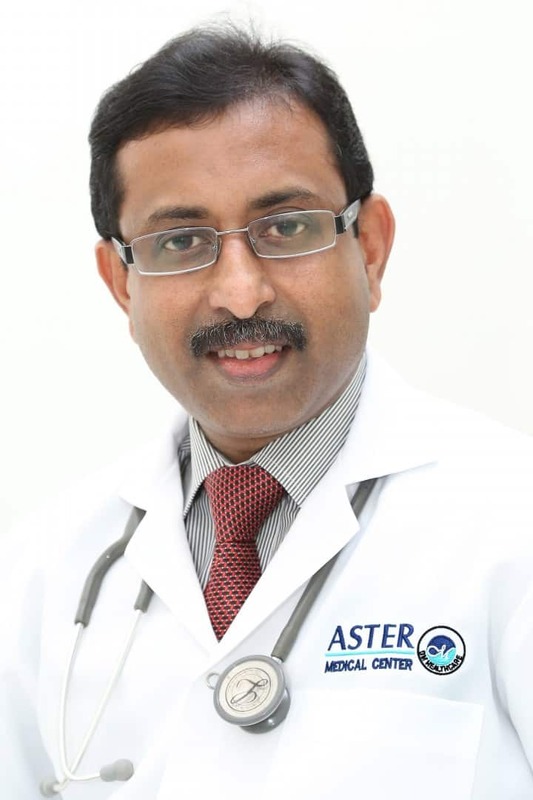 Dr. Arun Asok Cheriyan MBBS, MD (Medicine), DM (Cardiology), Fellowship in EP (NZ) is the Specialist Cardiologist at Aster Clinic (Jubilee), Bur Dubai. He started his Cardiology practice with the establishment of Cathlab services at Sagara Co-Operative Hospital and the introduction of Primary Angioplasty Program at Alleppey Medical College in the coastal district of Alleppey in Kerala. He was subsequently trained in Electrophysiology at the prestigious Greenlane Cardiology Services at Auckland City Hospital, New Zealand following which he was instrumental in the expansion of Interventional Cardiology Services at Moulana Hospital in North Kerala with the introduction of Electrophysiology Services and the establishment of an EP lab. 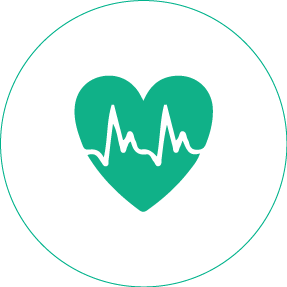 His areas of interest are Arrhythmias and Heart Failure. Dr. Kottal Balachandran completed his MBBS in 1972 from Kerala University. Passed MD in 1978 from Calicut University, Kerala, and DVD in 1991 from Calicut University, Kerala. He was working as Dermatologist in different hospitals in India and Skin Specialist in Riyadh, KSA. 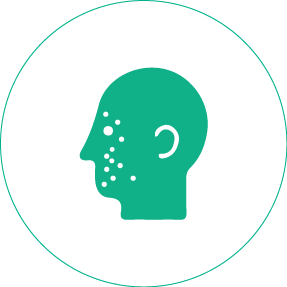 He has joined DM Healthcare as Specialist Dermatologist/skin care specialist in July 1999. 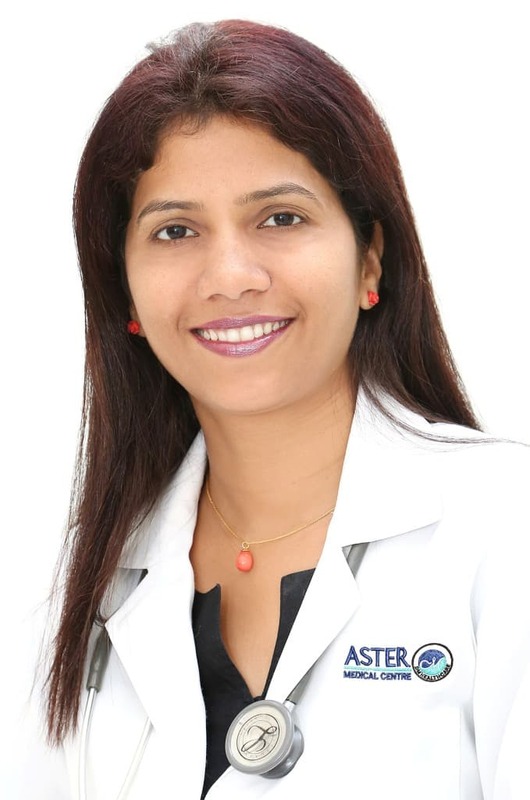 Dr. Shubhangi Perkar is working as Specialist Dermatologist at Aster Beauty Clinic (Aster Jubilee Medical Complex), Bur Dubai, Dubai. She received her post graduation in Dermatology from Vardhaman Mahavir Medical College and Safdarjung Hospital, New Delhi. 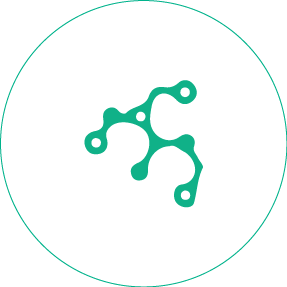 Post specialization she acquired over 3 years of experience in the field of Dermatology, Cosmetology, and Aesthetics. She had short observership at Mangat, Holzapfel and Lied Plastic Surgery Centre, Cincinnati, Ohio (U.S.A). Prior to joining Aster DM Healthcare, Dr. Shubhangi worked as a Consultant Dermatology at Kaya Skin Clinic (South Extension II, New Delhi), Reva Aesthetics (South Extension II, New Delhi) and Life Care Hospital, Nagpur. 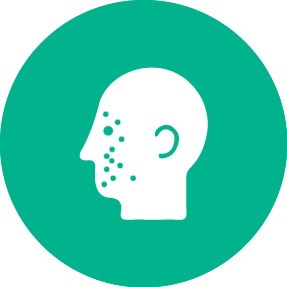 Assimilating the knowledge of dermatology and fusing it with cosmetology, She strives to see a smile on the faces of her patients having concerns for their skin disorders or appearances. Dr. Mukesh is working as a Specialist ENT Surgeon at Aster Clinic (Aster Jubilee Medical Complex), Burdubai. Dr. Mukesh Kumar Ramani has completed MBBS from Thanjavur Medical College, Tamilnadu, India; MS (ENT) from B. J. Medical College, Ahmedabad, India and DNB from National Board of Examinations, New Delhi, India. He has around 5 years of experience in India. He joined DM Healthcare in May 2012. 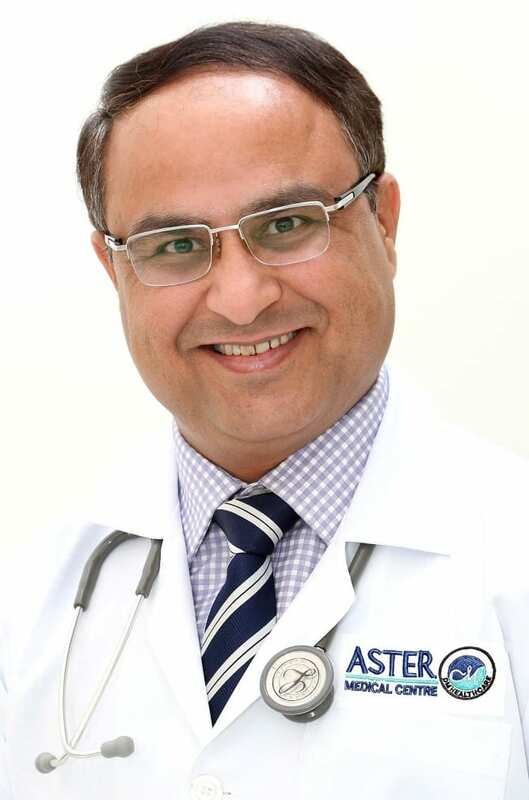 Dr. Harbir Singh Hundal is currently a Specialist ENT at Aster Jubilee Medical Complex. He completed his MBBS from the SP Medical College in Bikaner and his MS from the SMS Medical college in Jaipur. 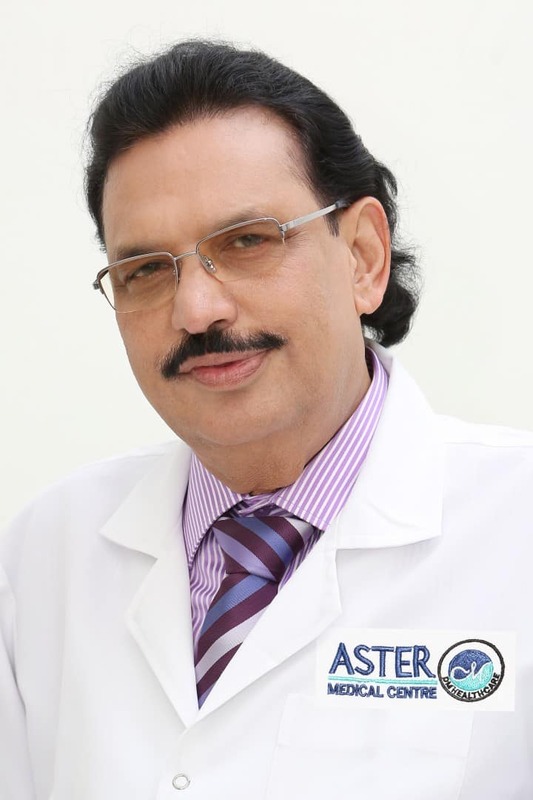 Prior to joining Aster DM Healthcare Dr. Harbir garnered over 20 years of experience in the field of ENT in various roles across hospitals in India. 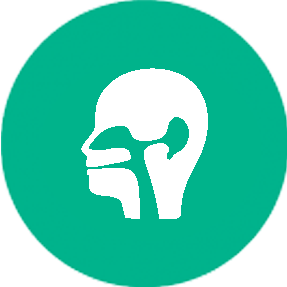 His areas of specialization include conducting micro ear surgeries, endoscopic sinonasal surgeries, and micro laryngeal surgeries. 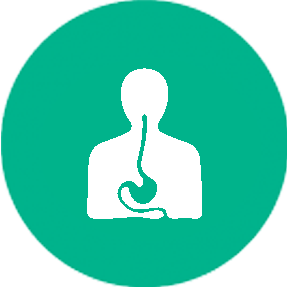 Dr.Thomas Joseph is a specialist Gastroenterologist at Aster Jubilee Medical Complex, Bur Dubai. 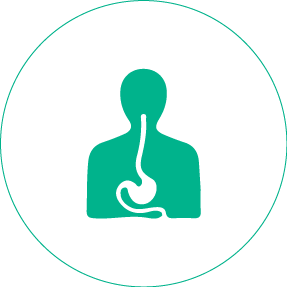 He was working as Assistant professor in Gastroenterology in Government Medical College, Alappuzha, India before joining Aster in September 2013. 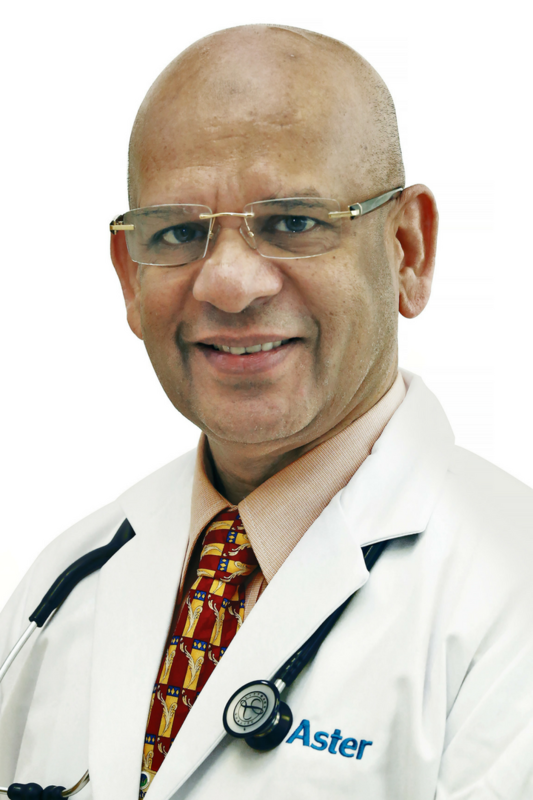 Dr. Jerry Ignatius, MBBS, D’Ortho, MS (Orthopaedics) has joined our Group as Specialist Orthopaedic Surgeon at Aster Jubilee Medical Complex, Bur Dubai. He has completed MBBS from Medical College, Trivandrum, D’Ortho & MS (Orthopaedics) from Kottayam Medical College, Kerala, India. He has around 9 years of post-MS experience. He joined Aster DM Healthcare in 2013 and is working as a Specialist Orthopedic Surgeon in Aster Jubilee Medical Complex, Bur Dubai. 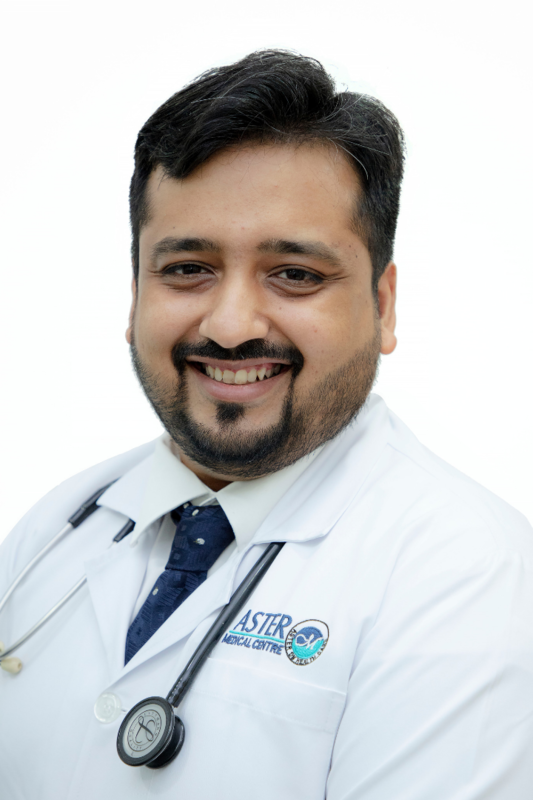 Dr. Mithun Shivgouda Patil is working as an Orthopedics Specialist at Aster Jubilee Medical Complex, Bur Dubai. He has completed his graduation and post-graduation from Rajiv Gandhi University of Health Services, Bangalore. He underwent Orthopedic training from Bangalore Medical College and Research Institute in 2007. 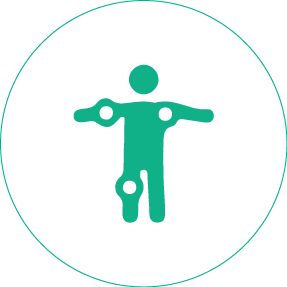 He has received Specialized Training in Arthroscopy and Arthroplasty. He has co-authored national and international papers. 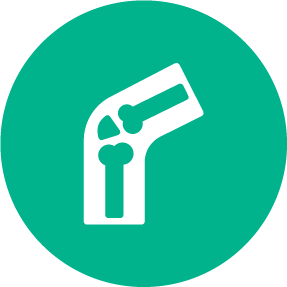 He has a vast experience in evaluation and management of fracture, sports injuries (ligament injuries, shoulder related problems), arthritis of the hip & knee, back pain and nutritional bone diseases. 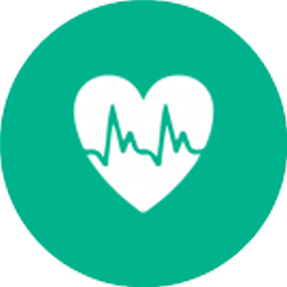 His aim is to provide the best care for his patients based on sound knowledge and the latest technology. 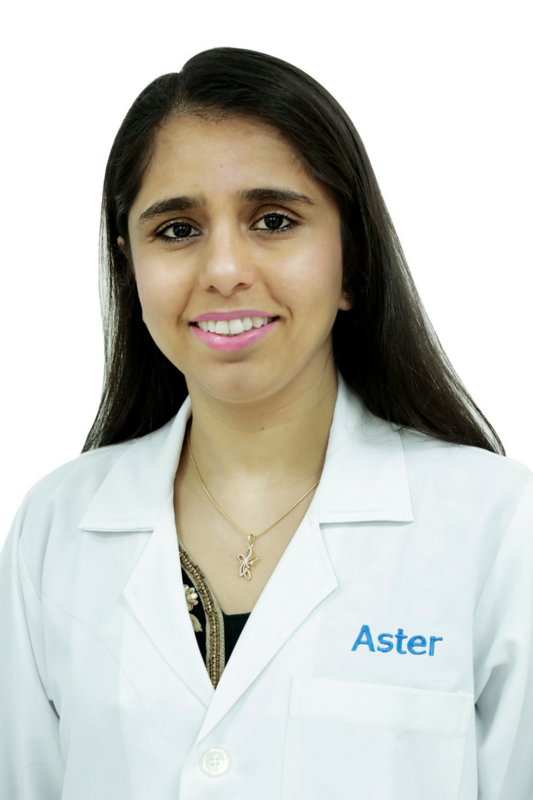 Dr. Maya is working as a General Dentist and as a Periodontist at Aster Clinic (Aster Jubilee Medical Complex), Burdubai. 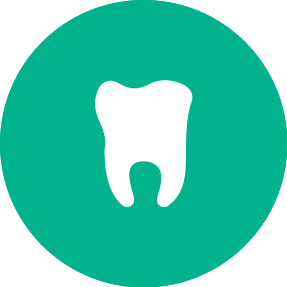 Dr. Maya studied in College of Dental Surgery, Manipal UG & PG. She has about 7 years of working experience in India, where she was also managing her own Dental Clinic. In addition, she has taken additional training in the University of Sharjah in a hands-on course on Implantology. 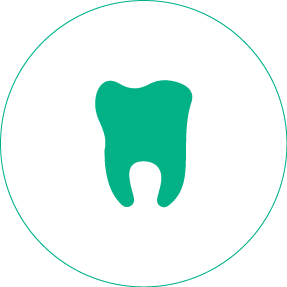 Dr Aarthy is a Specialist Prosthodontist and Implantologist with several years of Experience in Prosthetics, Implants, Smile Designing and General Dentistry. She finished BDS & MDS in Saveetha Dental College and Hospitals, Chennai, Tamilnadu, India. With several 1000 cases handled till date, she’s perhaps one of the most intuitive and pragmatic doctors in Dubai today. Dr. A.P. 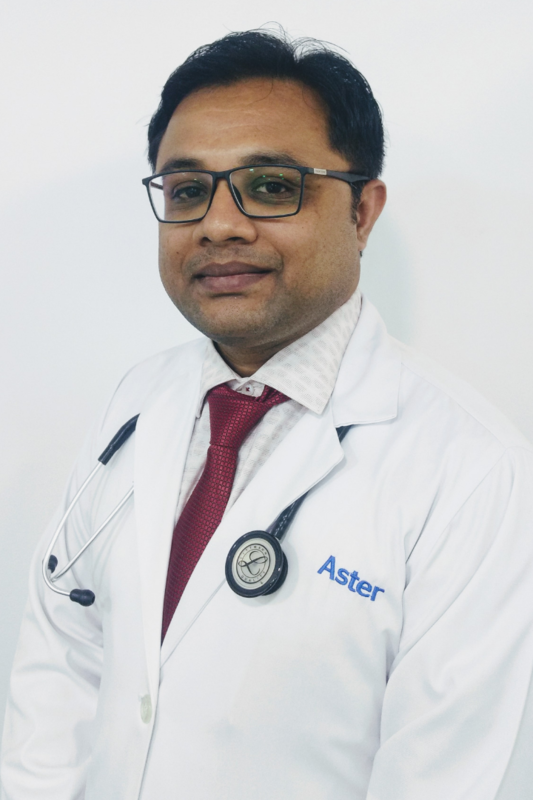 Mohammed, MBBS, MS (Ophthalmology) has rejoined our group as an Ophthalmologist at Aster Jubilee Medical Complex, Bur Dubai, Dubai. He has completed his MBBS and MS from Calicut Medical College. 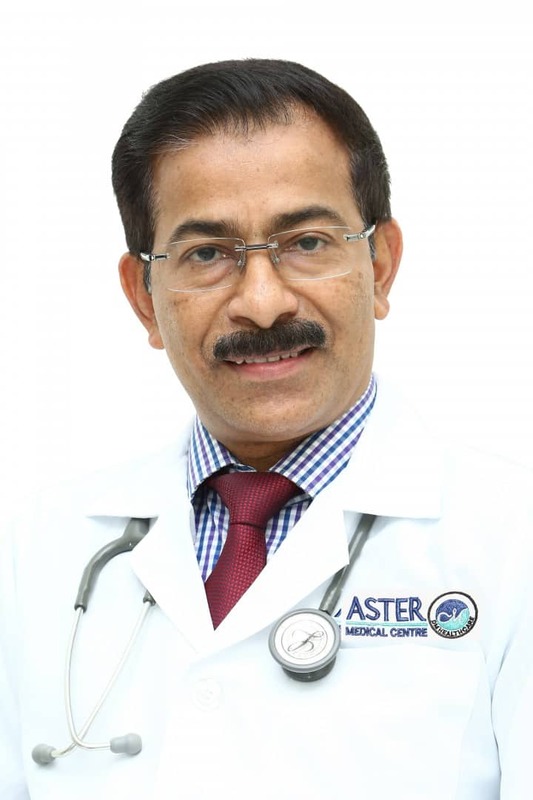 Dr. Mohammed was working at Aster Clinic for 20 years after which he went to India for a year and has now rejoined our Aster Clinic, Bur Dubai as an Ophthalmologist in the year 2015. 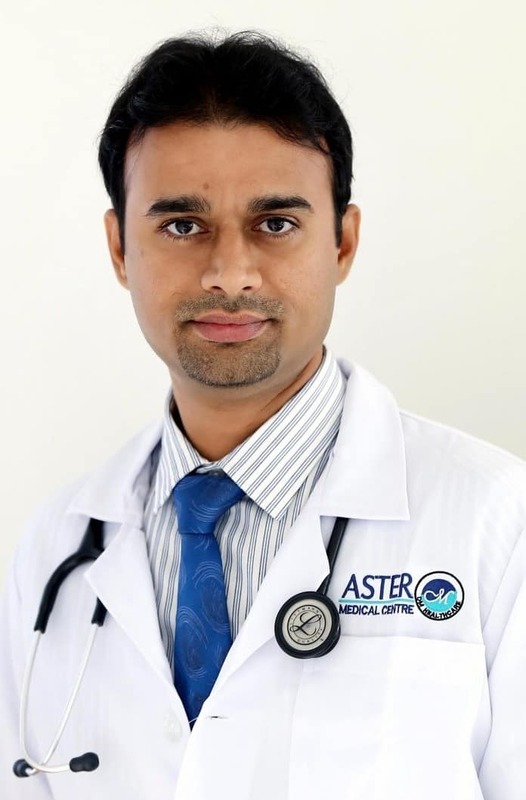 Dr. Anurag Mathur, MBBS, MS (Ophthalmology) has joined our group as Specialist Ophthalmologist at Aster Jubilee Medical Complex, Bur Dubai, Dubai. 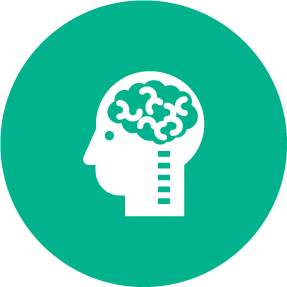 He has completed MBBS from Govt Medical College, University of Rajasthan, Jaipur and MS (Ophthalmology) from B.J Medical College, Gujarat University, Ahmedabad, India. He has around 6 years of post MS experience in India. 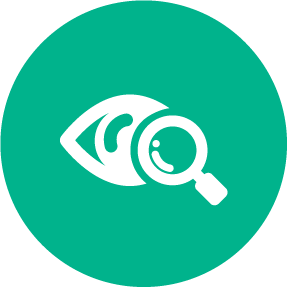 He has done Fellowship in Cornea and Cataract and Refractive surgeries from Prestigious LV Prasad Eye Institute, Hyderabad. 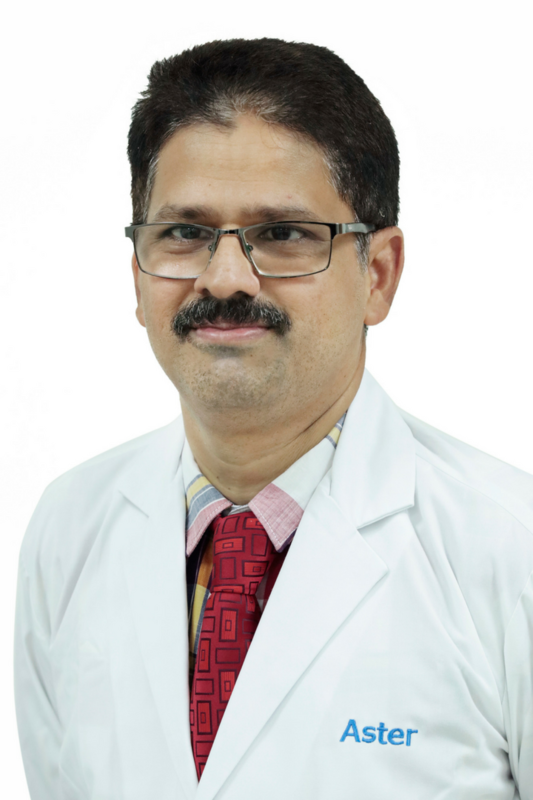 Dr. Nazeer Ahamed has completed his MBBS from Calicut University in the year 1989, MS from Mahatma Gandhi University in the year 1992 and M.Ch in Urology from Calicut University in the year 1997. He was working as Tutor in Department of General Surgery at Trichur Govt Medical College; Kerala. He was also working as Junior Surgeon at Metropolitan Hospital, Trichur, India. 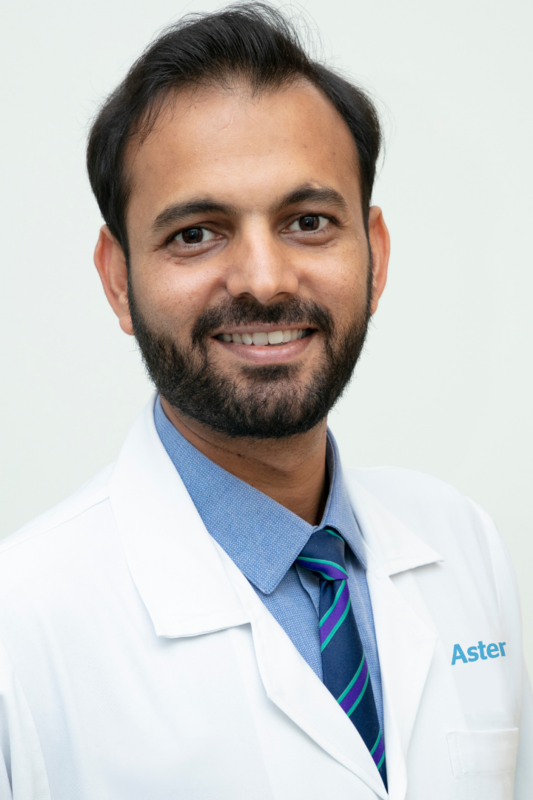 He has joined DM Healthcare in August 2006 and currently working as a Urology Specialist in Aster Clinic, Bur Dubai. .
Dr. Rahul Bhatt is working as a Specialist Urologist at Aster Jubilee Medical Complex. 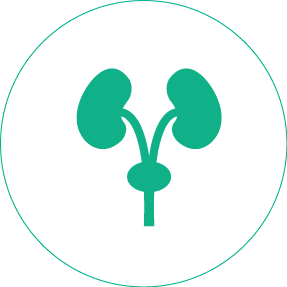 After qualifying from India’s most prestigious Urology institute - Muljibhai Patel Urology Institute, Dr. Rahul worked as a Uro-oncologist for a brief period at India’s topmost Cancer Center, Rajiv Gandhi Cancer Institute. 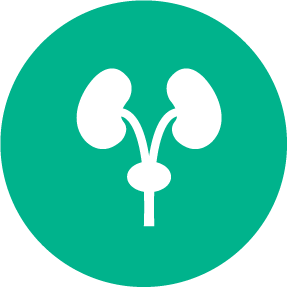 Thereafter he has spent almost 10 years in a very successful and a busy Urology Private Clinic. 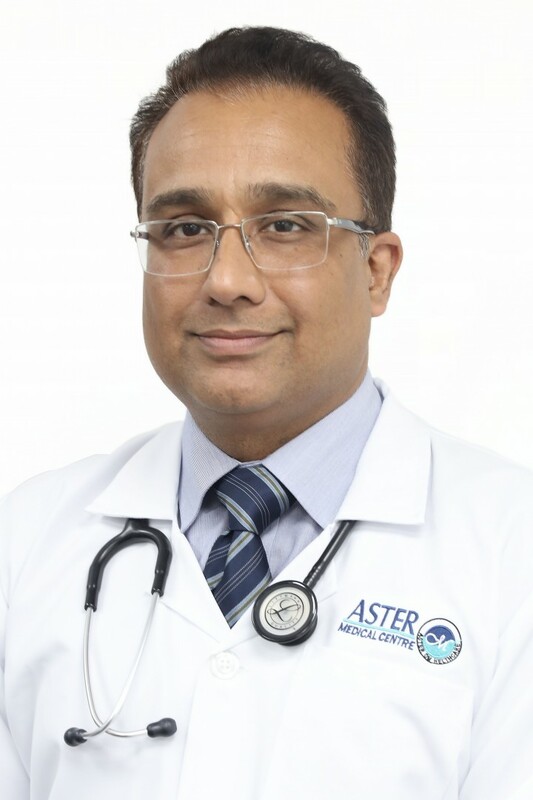 Dr. Prakash is working as an Endocrinologist Consultant at Aster Clinic(Aster Jubilee Medical Complex), Bur Dubai since 2002. He was born and did high school in Kuwait. He received his MBBS, MD from J.N.M.C., Belgaum, Karnataka & DM (Endocrinology) from T.N. Medical College, Nair Hospital, Mumbai, India. He was also a lecturer in Nair Hospital from 1999 to 2002. He has been in Dubai and with D.M. 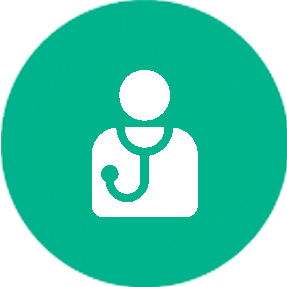 Healthcare since 2002 and is working as a Consultant Endocrinologist. 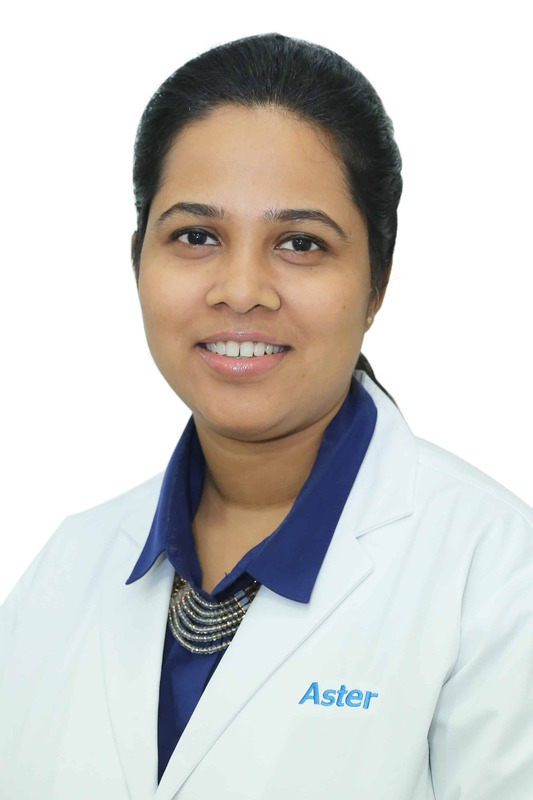 Dr. Maneesha Pandey is working as a Specialist Endocrinologist at Aster Clinic (Aster Jubilee Medical Complex), Burdubai. She has over 6 years of experience post her D.M in the field of Endocrinology. 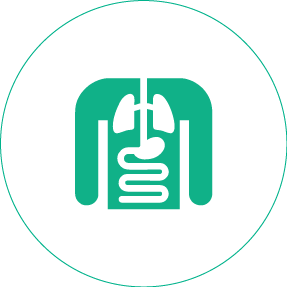 Dr. Pandey has experience of managing a wide spectrum of adult and paediatric endocrine cases. She specialises in managing various types of hormonal diseases like diabetes (adult & children), thyroid disorders, PCOD, obesity, growth disorders, reproductive hormone disorders, infertility, osteoporosis, pituitary and adrenal issues. 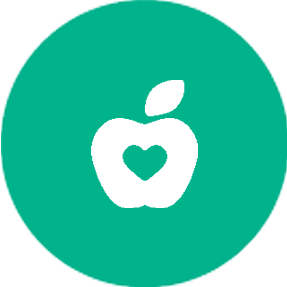 Ms. Lubna is a Registered Dietician at Aster Clinic, Bur Dubai. She Completed her B. Sc. in Foods, Nutrition & Dietetics (Mumbai University) in 2001 and her Post Graduation Diploma in Dietetics and Nutrition (National Council, India) in 2002. She has worked as a Chief Dietitian at a Multispecialty, Bhatia Hospital, Mumbai. She has also worked as a Diet Counselor with VLCC Pvt. Ltd. She became a part of D M Healthcare since July 2008. 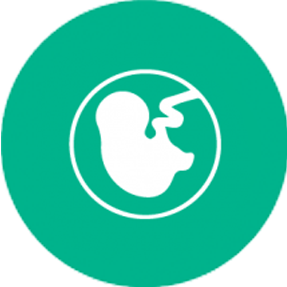 Dr. Dinesh Jacob has done his MBBS in the year 1988 from Calicut Medical College, MD (1992) and DM (1997) from prestigious Kasturba Medical College, Karnataka, India. 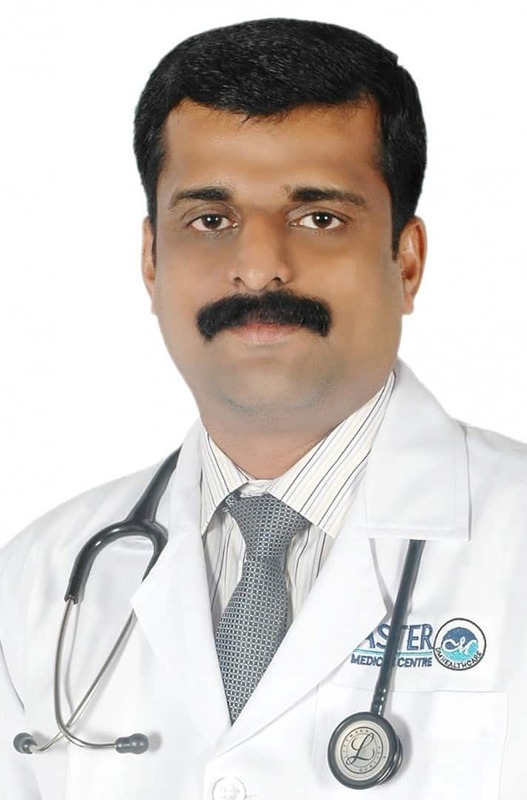 He was associated with National Hospital as Consultant Internist and later after his DM he was working with Trichur Heart Hospital and Aswini Hospital, Trichur, India as Consultant Neurologist. 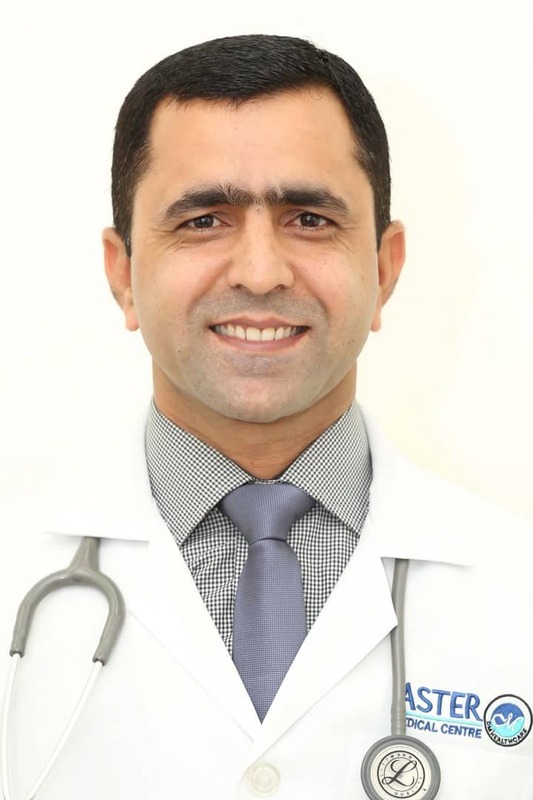 He has joined DM Healthcare in July 2005, now he is the Specialist Neurologist in Aster Jubilee Medical Complex, Bur Dubai. 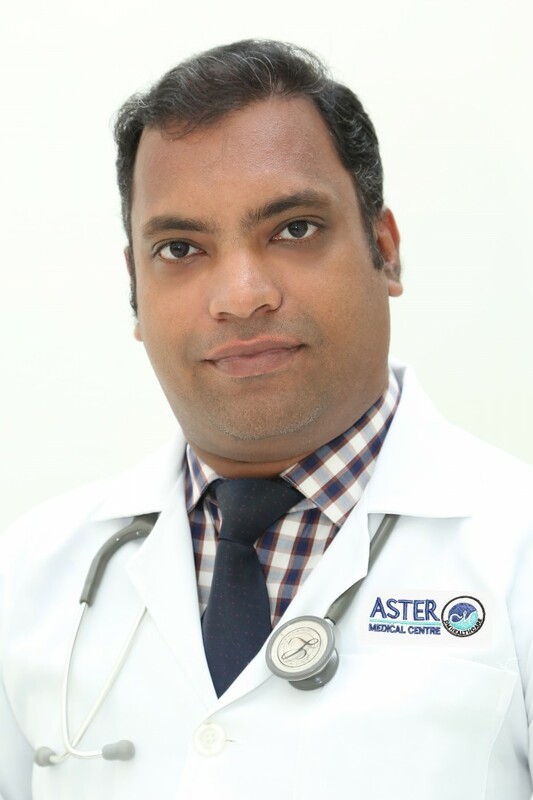 Dr. Mahendra Ramadas is a Specialist Neurologist at Aster Clinic, Bur Dubai. He completed his MBBS from Government Medical College, Calicut. 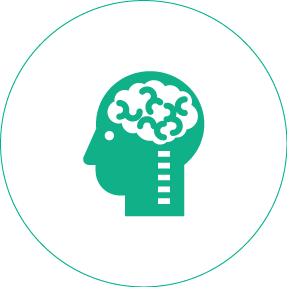 He did his MD in General medicine from Government GR Medical College, Gwalior and DM in Neurology from the prestigious National Institute of Mental Health and Neurosciences, Bangalore, India. Dr. John completed his M.B.B.S. from Bangalore University in 1998, M.D. Internal Medicine from Rajiv Gandhi University of health sciences, Bangalore in 2002 and his D.N.B. Nephrology from the National board, New Delhi. 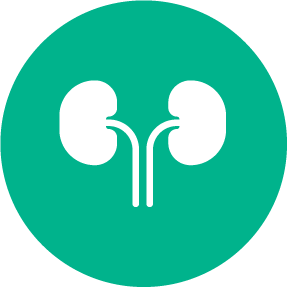 He has worked at Amrita School of Medical Sciences, Kochi and at King Khalid hospital, Saudi Arabia As a Specialist in Nephrology. 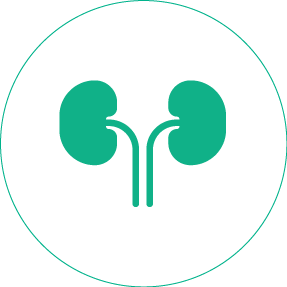 He is a member of the International Society of Nephrology, European renal association and Indian Nephrology society. He has joined Aster DM Healthcare from April 2013, He is now working as a nephrology Specialist in Aster Jubilee Medical Complex, Bur Dubai. 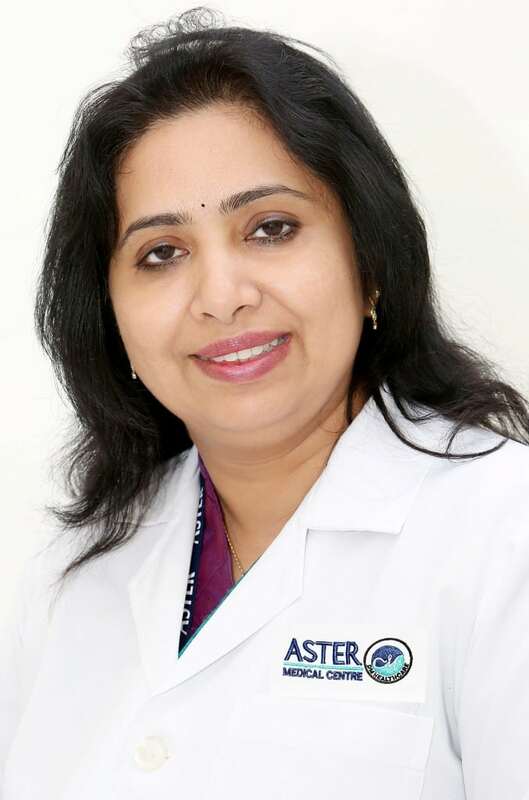 Dr Kirthi is a Consultant Rheumatologist at the Aster Clinic, Bur Dubai Aster Hospital (Mankhool), Medcare Orthopedic and spine hospital and Medcare Hospital in Dubai. She is associated with the DM health care from the last 4 years. 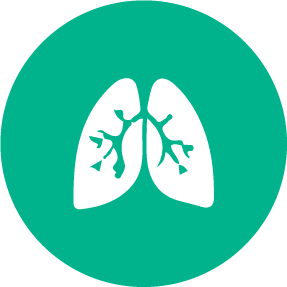 At Aster, she was instrumental in setting up the department of Rheumatology. 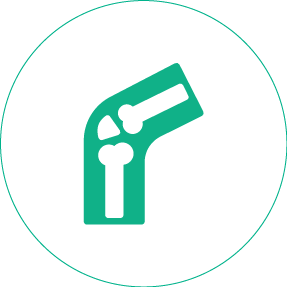 The majority of the patients managed are those with inflammatory arthritis mostly Rheumatoid arthritis, Psoriaticarthritis, Ankylosing Spondylitis &Gout. 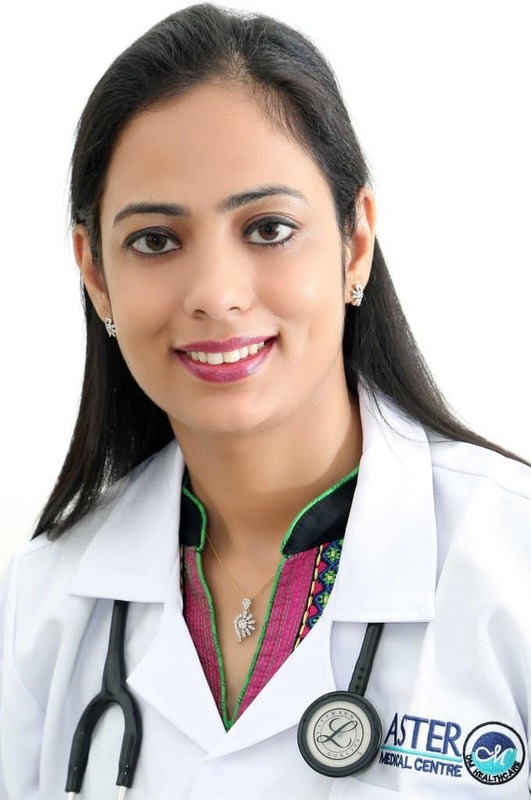 Besides those patients she has also seen patients with systemic connective tissue disorders such as Lupus, Myositis are also managed Before joining DM Healthcare she was a full time Consultant at Global Health City, & part time consultant at Fortis, India. She was also associated with Sri Ramachandra Chandra medical center as faculty in Rheumatology & Telemedicine. 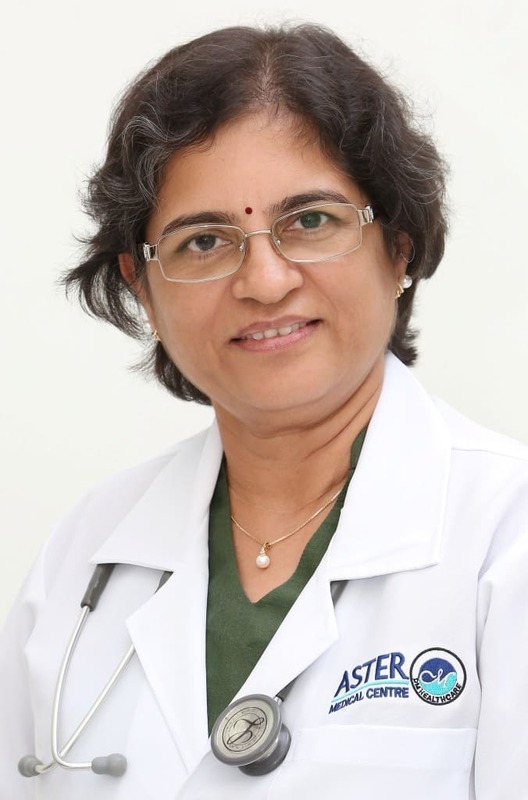 She did her Rheumatology training- DM- Rheumatology( Post-Doctoral training) from the prestigious Madras Medical College.She graduated (MBBS) in 1995 & did her post graduation in Internal Medicine (MD) between 1996 - 1999. 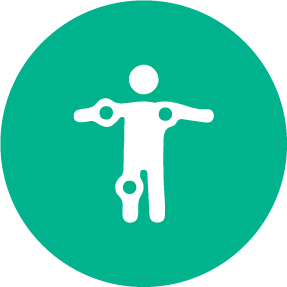 She has attended the Advanced Musculoskeletal ultrasound course conducted by EULAR and is in the process of incorporating Ultrasound as a part of routine rheumatology evaluation. 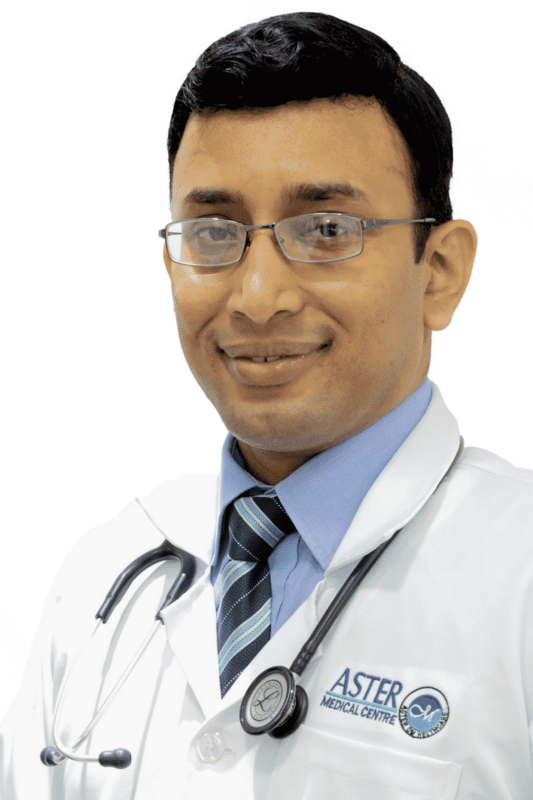 Dr Sajesh completed MBBS from Government Medical College, Thrissur Kerala, in the year 2003 and MD from Government Medical College, Calicut in the year 2009. He started working since 2009, worked in Government Medical College, Thrissur(2009-2010) and also in Jubilee Mission Medical College, Thrissur(2010-2013). 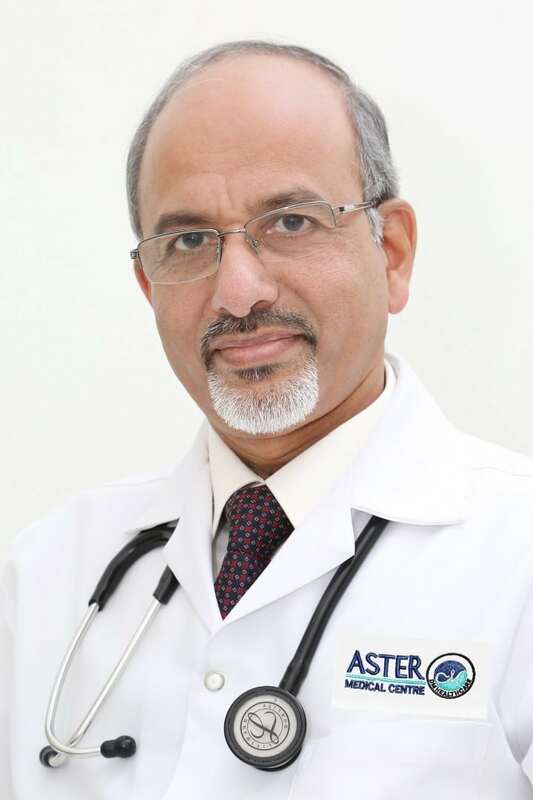 He joined Aster on 22/08/2013 as a Specialist General Surgeon now working in Aster Jubilee Medical Complex, Bur Dubai. 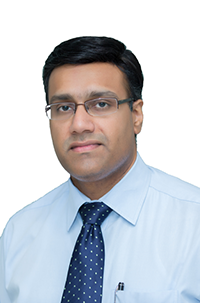 Dr. Yashdeep S Sarma is a specialist general & laparoscopic surgeon working with Aster Clinic, Bur Dubai (AJMC). 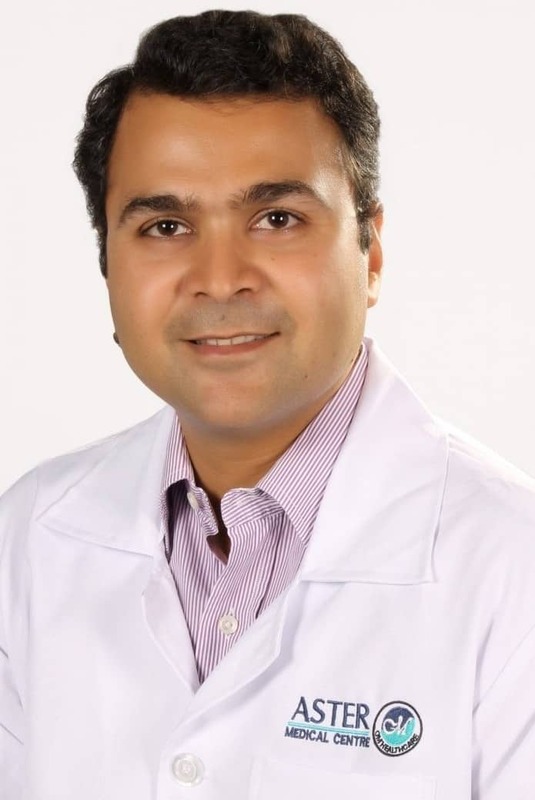 He completed his MS in 2009 and worked with KMC, Manipal for 5 years before joining Aster Clinic in 2014. 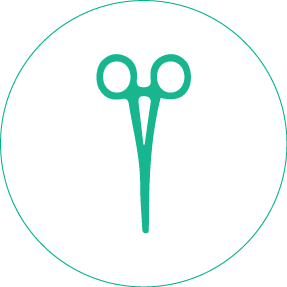 He has a special interest in GI & laparoscopic surgeries. 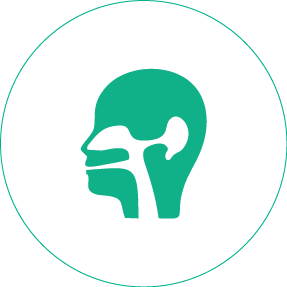 He also has interests in thyroid and salivary gland surgeries.